2 of 6 Place peanuts in a food processor. Pulse until finely chopped. Add cookie dough, flour and peanut butter. Pulse until dough is well combined, and cleans the inside of the bowl. 3 of 6 Divide dough into 2 equal parts. Wrap one part in plastic wrap and refrigerate until ready to use. Roll the other half between two sheets of parchment or waxed paper to a thickness of 1/4 inch. Place on ungreased baking sheet; freeze for 5 minutes. 4 of 6 Remove from freezer and peel off paper. 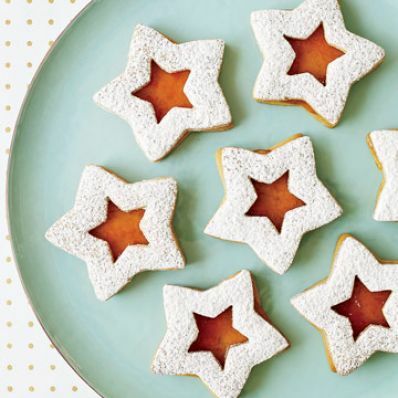 Cut out star shapes with a 3 inch star cutter and place back on the baking sheet. Re-roll scraps and cut out more stars for a total of 18. If dough becomes too soft, place back in freezer for a few minutes. Bake for 11 minutes at 350 degrees F. Allow to cool on baking sheet for 2 minutes. Remove to a wire rack to cool completely. 5 of 6 Roll out the remaining dough and cut out 18 stars as in steps 3 and 4. After placing on baking sheet, cut out center with a 1-inch star cutter. Bake and cool. 6 of 6 Microwave the apricot preserves for 30 seconds. Stir until smooth. Spread 1 teaspoon of the preserves onto one side of each of the uncut cookies. Dust the cut-out cookies with the confectioners' sugar and place on preserve-topped cookies to form a sandwich. Press gently.